Hello and welcome to The FRBeat! What is The FRBeat and what is this post? Well, this is the start of a new project for me. My name is Emily Petroff and I’m an astronomer working in the Netherlands. I study a type of astronomical source called ‘Fast Radio Bursts’ or FRBs for short. FRBs are new and mysterious. They are short bright radio pulses that last about a millisecond and that we think are coming from other galaxies all over the Universe. If they’re coming from as far away as we think they are (billions of lightyears away) then they release more energy in that one millisecond than almost any other process in the Universe! But the explanation for these pulses is still a blank. We think they might be coming from compact dense objects like black holes or neutron stars — either when they collide and explode, or when they’re very young and energetic. My job is to figure it out! So why am I writing about it here? Partly because I think FRBs are extremely interesting, and I think you will too. But also because we’re on the tip of a big change in this field and I think we’re going to learn more about FRBs each year in the next few years than we’ve learned in the past decade of studying them combined. New telescopes are coming online around the world to look for more FRBs over more sky more of the time, and we expect that we’ll go from finding 5 a year to 5 a month, and maybe even 5 a day! Maybe we’ll solve it in the next few years, and maybe we won’t, but either way it’s going to be such an exciting and fascinating time. And I want to share it with you. I have lots of ideas of what to include in this series, but I’m also keen to hear from you. If you have a particular topic you’re interested in or an aspect of astronomy research you’d like to know more about, please let me know! You can reach out via Twitter as always, but I’ve also included a response form at the bottom of the page, and you can comment on each post for specific questions. I’m excited to start this project and tell you more about the wonderful world of FRBs and other exciting astronomical explosions. Next week I’ll have my first post about the new results from the ASKAP Telescope in Australia, so stay tuned! A photo of me in my natural habitat: playing with big telescopes. 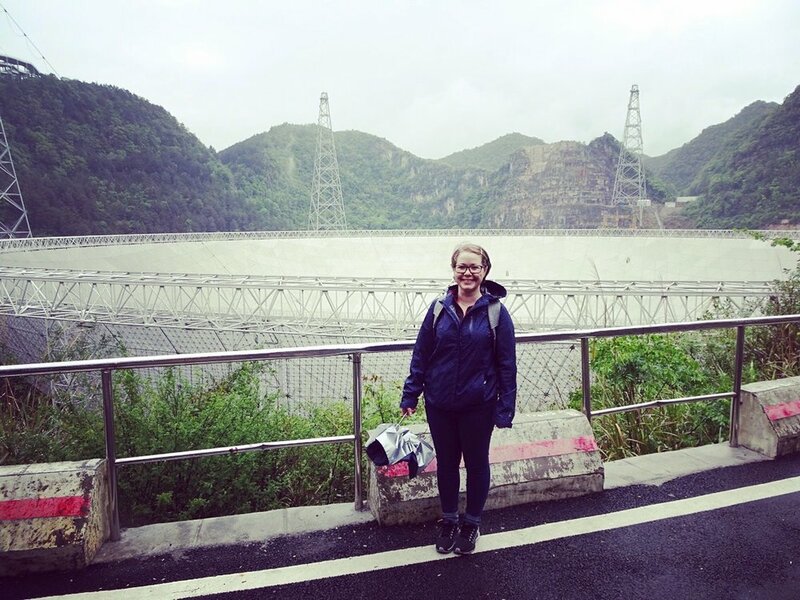 This was at the 500 Metre Aperture Spherical Telescope (FAST) in China. The idea behind this "blog" is to keep a running documentary of new exciting developments in the world of fast radio bursts -- new discoveries, new telescopes coming online, interesting and inspiring people working in the field, and also some occasional notes about other astronomy news, since I'm guessing that FRBs won't be the only interesting things to make a big splash in the near future. The main updates will be written pieces, but depending on available resources I also hope to make this documentary more of a multi-media platform with some videos and art and other fun things. What sorts of things depends on input from you! Let me know what you'd be interested in seeing/hearing/reading about when it comes to fast radio burst news. That's it for now. 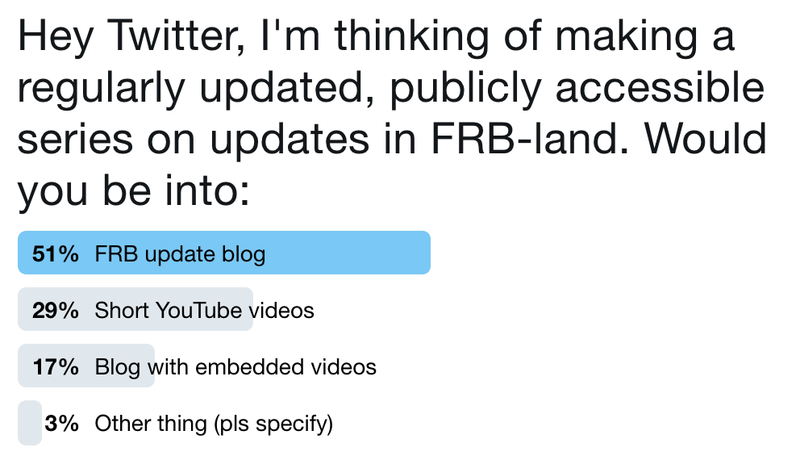 I'm very much hoping that this will be your new go-to place for news and info about FRBs! Do you have ideas/questions/comments/things you’d like to know more about?